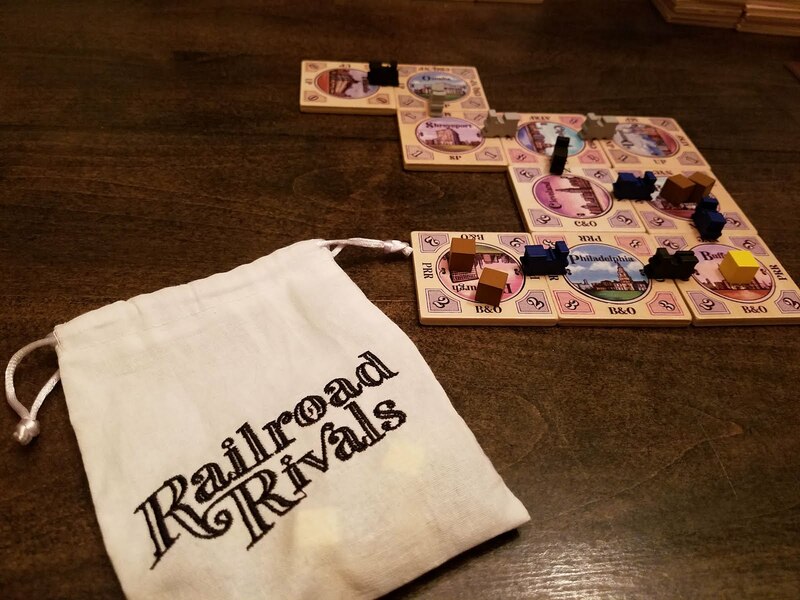 tl;dr: Drafting and tile-laying built behind a high-stakes auction with historically accurate railroad mechanics and art. Pure, mainlined fun. Getting to the Game: Setting up Railroad Rivals is a simple matter of shuffling the stock tiles and placing them in one area. Then, shuffle the city tiles and place them nearby. (Pro tip: because tiles are notoriously difficult to shuffle, do your best, and then place each type in several stacks. When you draw tiles, draw different amounts from each stack every time.) Assign each player a color, and then choose which side of that color's character tile is face up (masculine or feminine- a wonderful addition). Deal each player two city tiles, and randomly determine player order, placing the character tiles in that order from left to right on the table. Take all the smaller stock squares and place them to the left of the score tracker. 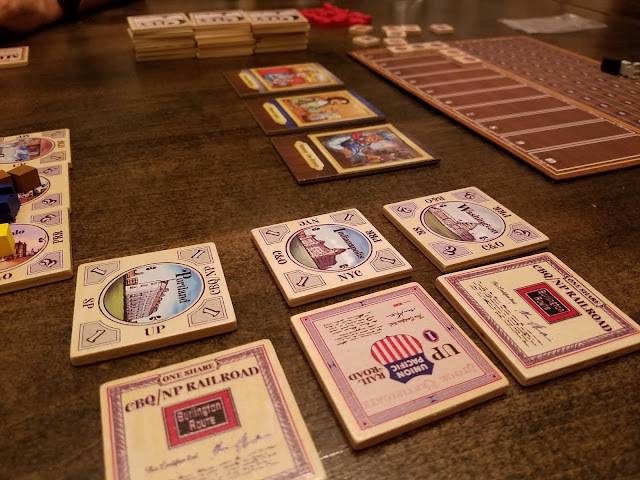 Each player places one of their trains on the score track (IT'S LITERALLY A TRAIN TRACK) as outlined in the rulebook, depending on order. All aboard. Your goal here is to accumulate the most points by delivering random goods drawn from the bag from one city to another, as well as maximizing the stock value of the actual rail lines you own shares in. Each turn, you're going to be participating in an auction where you bid your points in an attempt to move your character tile to the first position. Then, you'll draft in player order - one stock and one city, in any order you choose. Both of these steps can be incredibly cutthroat, so pay attention to what's available to draft and where you're at on the score track. 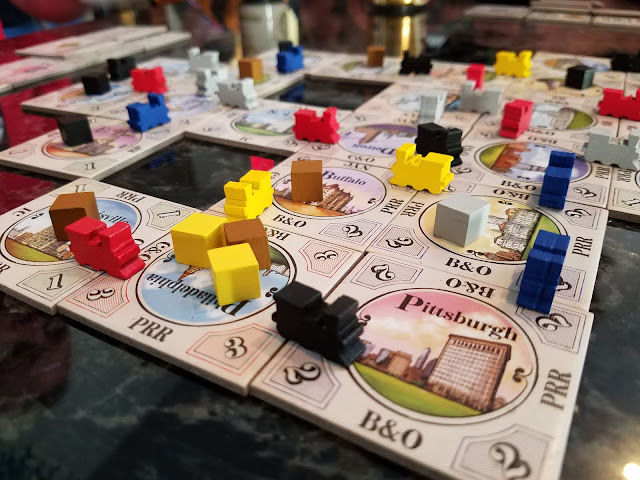 Playing the Game: This game hits all my sweet spots mechanics-wise, so I'm going to be the first one to say that I might be slightly biased when it comes to the review. If you wanted to make a game specifically to make me happy, it would have drafting, auctioning, tile-laying, quality wooden components, room for more than four players, and a stock market. If those aren't your thing, then by all means, please ignore how effusive I'm about to be. For the rest of you, this game is as good as it gets. Right off the bat, the auction for turn order doesn't mess around with an alternate currency. You're not bidding money which can then be used to buy something else that gives you victory points at game's end. You're literally bidding with the thing you're trying to get out of the auction. If you don't think that having the first chance to draft and lay down a tile and then move goods is going to get you more points than you're bidding, you should stop. There's no intermediate math to get in the way here. Secondly, the draft portion of the game is for the face-up tiles that are dealt out before the auction happens. Unlike in other drafting games like 7 Wonders or Sushi Go, you have perfect information about what the value on the table is. Don't like what's out there this round? Feel free to bid low or pass. Don't think anyone likes what's out there? Win a low bid, and set yourself up for a quality second choice next round. Each round plays out so fast, eventually you're going to know that the fourth B&O Railroad stock hasn't been seen yet, and it's worth $6 a share, so it's going to be big to snap it up when it comes around. Finally, laying down a tile to connect at least one set of two matching railroads to each other is the requirement, but you're eventually going to discover the next level - locking off cities from anyone else by monopolizing an area - is both difficult and incredibly satisfying. Securing a cache of goods that no one else can deliver sets you up for getting away with a couple of rounds of bad draft position. 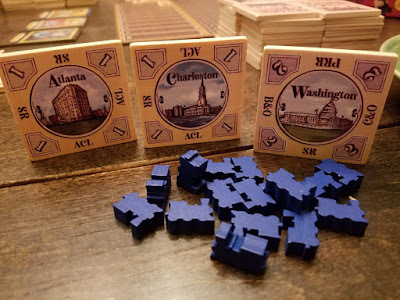 Conversely, drafting city tiles that allow you to place one anywhere you want it by diversifying the railroad connections is a solid play that keeps you flexible. 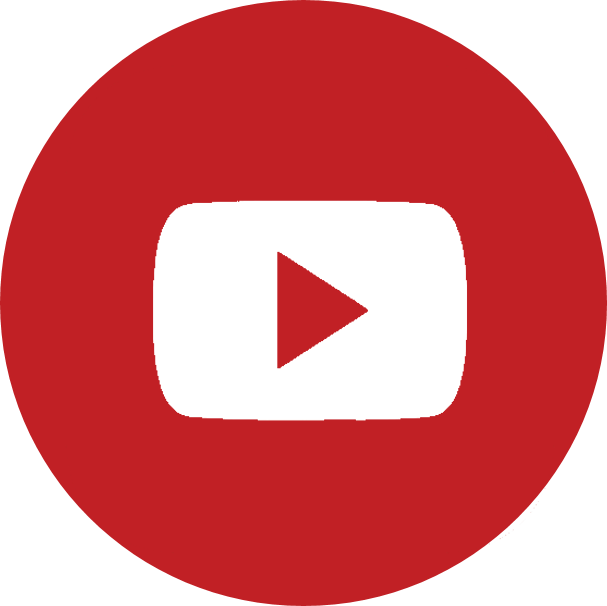 There are lots of strategies that work here, and even if you feel like you're losing, it's probably a lot closer than you think. In my third game, I started in third place of three people and only won a single auction towards the middle of the game. I won by over 10 points. The game ends in the round where everyone places their last city tile, and counting up stock values at the end of that round is some of the best score-jockeying fun I've had in a long while. 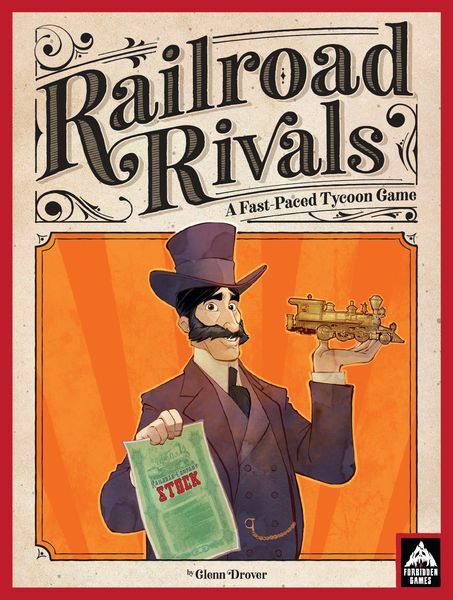 It's difficult for me to find negatives about Railroad Rivals. Playing at just about an hour, even with five players, is a huge bonus for me. One drawback is that without a solid grasp of how a whole game plays out, it can be tough to formulate a good strategy early. Learning this game for the first time at Gencon, I lost miserably because I didn't really "get" it until about halfway through. 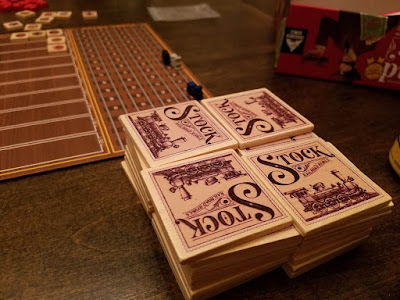 The first time I taught it to my group, there was a bit of confusion about where to prioritize their energy since you're drafting stocks and also trying to lay down good tiles with good connections. My advice to new players is to focus on the way the stocks work. The tile laying will take care of itself. Artwork and Components: I met Jacoby O'Connor whilst at GenCon, and he's a remarkably nice guy, as are all the folks at Forbidden Games. O'Connor and Kesinger's artwork really shines here, from the player tiles to the city backgrounds. The railroad stocks and logos are all historically accurate - this is a boon to the game from a historian's perspective, but also drew the most criticism from my playgroup. Once the tiles start to clutter up the play space, with railroad tokens and goods cubes all over the place, it's hard to tell at a glance what's what. Even looking at a player's stock portfolio takes a few seconds longer than you want it to because you can't easily distinguish some stocks from others. Again, familiarity with the game will solve that issue (it's already easier for me after a few playthroughs), but it doesn't help the new player learn as quickly as they would want to. The really good news is that the component quality is outstanding. 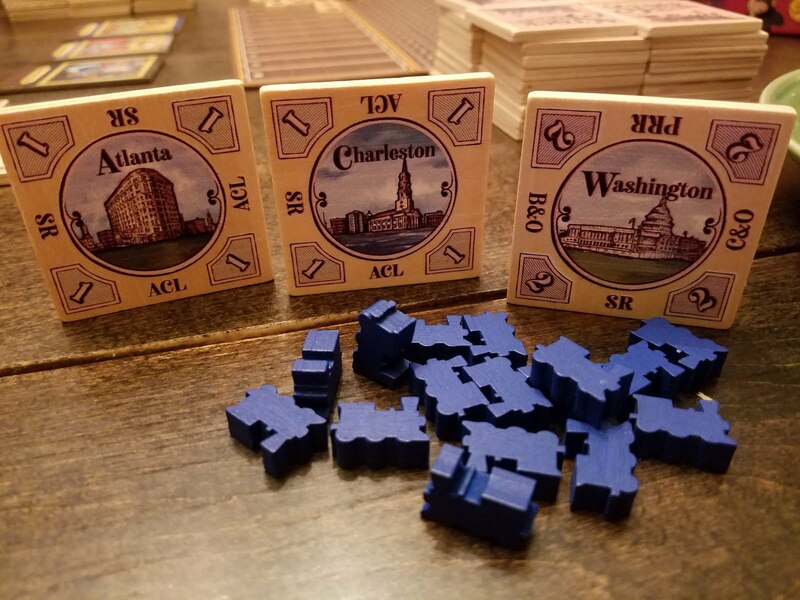 My review copy is the premium wooden edition, with 5mm wooden city and stock tiles, wooden stock marker tokens, and a couple extra in-game pieces. However, I was also able to play a couple of games on the standard edition of the game, and if you don't have the extra cash for the premium, you won't be disappointed with the build quality of the standard. That being said, if money is no issue, and you can find a copy of the Premium build, trust me when I say you'll have no regrets. The artwork transfers fantastically to wood, and the immersion ratchets up a few notches when you're able to move those satisfyingly chunky tiles around. The Good: Everything. Right up there with Wonderland, this game is going to be tough to beat come EBG's yearly roundup. 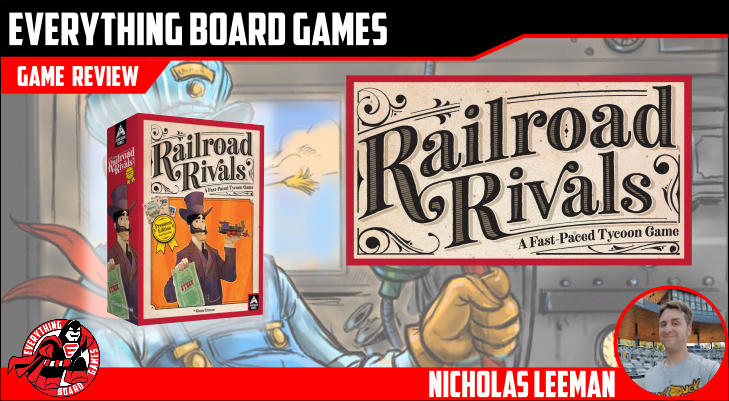 I have a ton of review games that I'm really excited about from GenCon, but I really just want to keep playing Railroad Rivals. It's that good. The Bad: Can be a little daunting for brand-new players as there's a few mechanics that all contribute in some way to doing well. Table presence can feel a little noisy. Score: Forbidden Games has two big hits here with this and the upcoming Raccoon Tycoon, and I almost feel bad I can't find more wrong with this game. I know it can be hard to read a review that feels more like an advertisement than a critical review. I'm not sorry, though. It's so very rare that a game comes along that truly delights me as much as this one does, and I'm glad I found it. 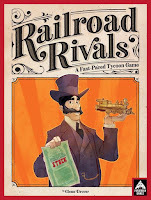 I'm giving Railroad Rivals a score of The Golden Spike.